The closed, painted, carpeted environment of the office felt oppressive at first but I soon settled into a comfortable rhythm for the morning, learning, researching, gazing at the clouds gathering outside, breathing and stretching when my mindfulness bell struck. I was expecting the frazzle from the past few days but instead, I felt peaceful. I felt focused and yet there was a tiny tingle. A slight buzzing. I thought maybe it was the caffeine in my tea. A glimmer of anticipation passed over me, though that may be hindsight describing it. The air felt crisp and clean, like before a summer rain shower. It felt good. I felt like I was doing exactly what I should be. My attention started to jump around but I didn’t fight it, I followed what felt like a natural flow, from the Q & A document I was reading, to an artist’s website that I admire, to another website, back to my homework. I wrote the tagline “Finding your creative self. Finding your way home”. I felt a sudden opening, an expanse inside me breathing its way into existence. I thought about the Pinterest board where I had pinned images of tiny boats on big seas, of mountains, birds flying, flags waving, the colour blue over and over and over again. The feeling in my chest matched the images so perfectly I wanted to cry. This! This is it! I thought. I started writing words: open, expansive, flow, freedom, space, explore, adventure, dive, float, river, ocean, mountain, birds. This is what creativity feels like. This sense of peace and completeness is why I do what I do. And THIS is what I want to help others experience. I first wrote these words back in March on the day that I figured out what I really wanted to do with my life - what I felt like I was meant to do. I realized then that my mission was to help people feel more creative, to do more creative things, and to experience creativity on a daily basis. I've spent most of my life struggling with creativity. Even as a child, I often felt like it was an intangible entity, just out of my reach, floating above me while I was stuck on the ground. I thought that creativity was something elusive and inconsistent. I thought that it was avoiding me. It didn't help that I was a perfectionist and extremely self-critical. My expectations were astronomical and I was frequently overwhelmed by them. From a young age I wanted to be an artist and a writer, and later an actor or a set designer. I held on tightly to my desire to work in a creative industry, despite society's message about how hard and impractical it was, and my own inner doubts. In university I majored in drama and constantly fielded questions about the job prospects of such a choice. I felt truly convinced that my dreams were possible, that I could create the life I really wanted. After university, however, my dreams faltered. I said yes when the chocolate store I'd been working at part-time asked me to be the manager. I felt a huge disconnect with the theatre community and stopped working in theatre. I made some art, but usually felt like my job took precedence over being creative, and to make it worse, I found that I was starting to enjoy the job less and less. I tried to think about other "sensible" jobs I could do but everything seemed either out of reach or unappealing. I began to feel defeated and depressed. Finally I realized that I had to leave the store, whether I knew what I was going to do or not. 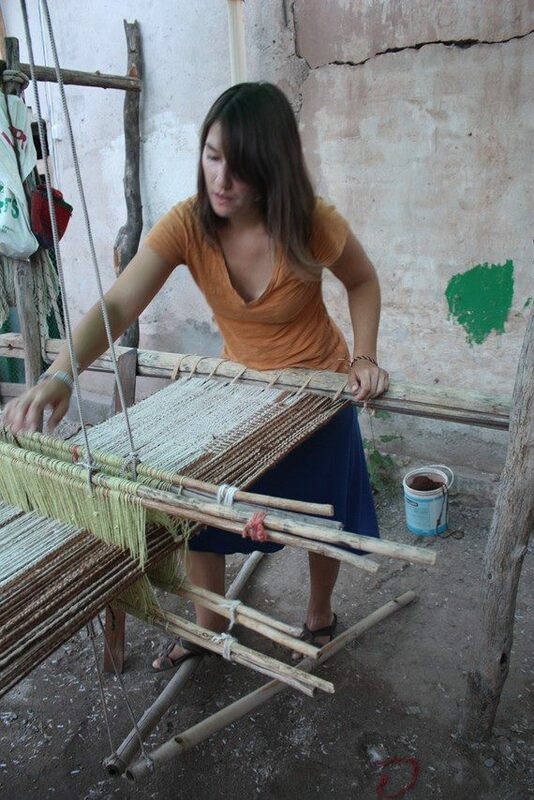 I gave my notice and when the time came to leave I went to South America to learn traditional weaving techniques. I figured that doing something so bold and adventurous would shake me out of my rut and help me be the person I knew I was capable of being. And it did. Travelling alone for 10 months stretched me in ways I couldn't have imagined, and crystallized what was truly important for me. Helping people, making the world a better place, and, above all, creating. That trip taught me to trust myself, to trust my desires and my capabilities, and showed me that I didn't need to get a sensible job. I was capable of creating my own path. Upon returning I set the goal of being full time self-employed within 5 years. Then I went and got another full-time job that I hated. I was still giving in to the fear and doubt that had always held me back. After only 4 months, however, I was laid off. The thought of trying to find another job was so painful to me that I decided to make the leap for real. A friend of a friend helped me get a part-time administrative position and I started working on my business in earnest. It's Joseph Campbell's hero's journey in a nutshell, as concise a synopsis of the story of Everyman as it gets. There's the initial crime (which we all inevitably commit), which ejects the hero from his homebound complacency and propels him upon his wanderings, the yearning for redemption, the untiring campaign to get "home," meaning back to God's grace, back to himself. I had always believed that everyone could be creative, but this quote helped me realize that our creative self is our truest self and that finding that self is like coming home after a long journey. Over the years I've learned that creativity is not out of reach. I've learned that we can establish habits and routines that help us access our creative self on a daily basis. My mission is to show you how. This journey that I've embarked on is certainly not an easy one, but I'm guided by the feeling that I actually couldn't do anything else. I'm learning so much and having a great time, and I'm glad that you're here to share this journey with me.